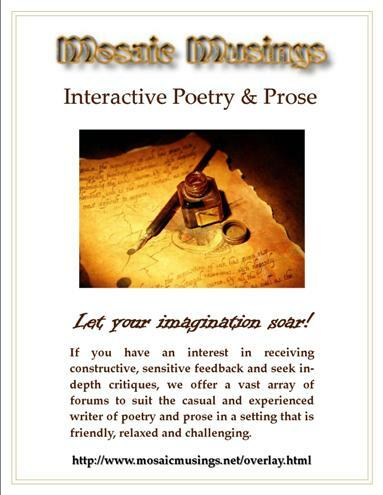 Back in October 2006, the Mosaic Musings Administration took steps to become a forum participant in a major monthly competition called The IBPC (InterBoard Poetry Competition) which is hosted monthly by Web del Sol. The IBPC aims to bring continual growth, in both quality and popularity, of poetry on the Internet. We believe MM would be a great asset to that union and benefit on several levels. We also feel that the talent and quality of works posted at MM is worthy of a larger audience. The InterBoard Poetry Competition was conceived in 1999 by Michael Neff, Director of Web Del Sol. Neff worked with the Atlantic, Utne, and other on-line poetry boards to create a meaningful mission for the IBPC. The goals were several. First, to seek to improve the quality of poetry and discourse on participating boards and on the Internet in general; second, to discover and publish new poets; and third, to help these new poets become recognized by leading literary periodicals. An informal launch committee established a preliminary set of rules and bylaws, and the IBPC took flight in spring of 2000. After only one year, the number of participating boards had doubled. The IBPC opened its doors to all quality boards, honed its by-laws, and further refined the IBPC contests. Judges for the IBPC have been many and distinguished, including Guggenheim winner Robert Sward, Joan Houlihan of Boston Comment fame, 1999 Pulitzer Prize nominee Harvey Stanbrough, the editorial staff of River Styx, Mark Yakich of River City, and many others. Two years later, with the birth of its new website at IBPC-POETRY.ORG, the IBPC and member boards are well on the way to achieving their goals. Today the IBPC includes about twenty participating boards, with more pending approval. IBPC recognition of poets, and the boards they represent, has become an increasingly prestigious honor. Meanwhile, the nature of the competition has fostered creativity and improved communication among the on-line poetry community. Recently, IBPC staff have successfully engaged print journals with the competition. We plan to continue bridging the media gap between internet and print poetry. A print anthology of best work is planned for 2003-2004. Our new site reflects the growth of the IBPC. It now includes “IBPC Selects” featuring the editor’s choice of favorite poems, direct links to Poets & Writers, Powells and other favorite sites, direct home page access to our participating boards, the most recent winning poems, and “IBPC: Newswire” - news and announcements of the many talented poets who workshop on the net. Our future is promising with a vision not only for the “InterBoard Poetry Competition” but for the continued growth of the “InterBoard Poetry Community”. 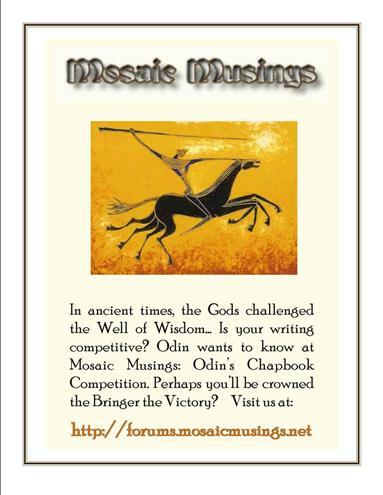 This is your personal invitation to represent and support Mosaic Musings in this monthly competition! Let's show them what we're made of! Poets: This contest is open to all poets at least thirteen years or older, published or unpublished. Current employees or volunteers of Web Del Sol or the InterBoard Poetry Competition are not eligible. 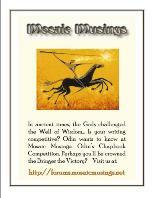 Only one entry per poet per monthly contest is allowed. Poems: Poetry must be the original composition of the submitter and may not have been published, either in print form or via electronic media. For this competition, published means any form of reproduction for which the writer received payment, either monetary or in kind. Poems which have been awarded prizes in other competitions are also ineligible, except school competitions, etc. Multiple Submissions: If a poet has more than one poem submitted for consideration, the IBPC Managing Editor will select one for judging. Others will be returned and the submitting boards requested to submit alternate selections. If the same poem is submitted by more than one forum, the poet will be asked to choose which board it will represent. The remaining boards will be requested to submit alternate selections. 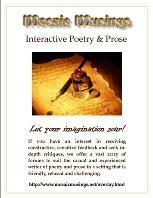 Forums: The minimum following criteria must be met before a poetry board can be accepted into the IBPC competitions. The board must number at least 25 posting members, be regularly critiquing and allowing postings of new and original poetry. (Note: though no minimum amount of poetry is required, competition administrators will monitor the boards to assure they are viable. ), regardless if registration or a password are required. Agree to publicize the winners in the competition. Fees: There are no entry fees, no subsidy payments, and no purchases of any kind required to enter and win the contest. Rights: All poems remain the property of the author. By having a poem entered, the author may also be eligible for the publication of the poem by the InterBoard Poetry Competition. The InterBoard Poetry Competition is under no obligation to publish every contest entry and can disqualify an entry at any time. All winners will be notified by email and posted on our internet site. Board Level: Each participating board will devise and implement its own method of poem selection. Competition Level: Each board editor may submit up to three poems, per month. These will be submitted via email on or before the third day of each month to the managing editor. Before poems are submitted, the authors will be notified and permission obtained. Copyright shall be retained by the author. Editors should request a best and final to assure the latest revision is judged. If poems are not received by the managing editor by Noon of the 3rd, Pacific time, the managing editor reserves the right to not forward the poems to the judge. Judging Level: The IBPC Managing Editor will remove all names and board titles to make each submission anonymous. These will then be forwarded by email to the judge on or before the 7th day of the month. An .rtf or .doc attachment (or a suitable substitute) is preferred in order to retain the work as formatted by the author. Poems may be in the body of email if the format can be preserved. Each month, the prizes of 1st, 2nd, 3rd places and an Honorable Mention will be awarded. These may be published in the periodically released IBPC Anthology. All rights remain with the author. Entries are judged on the basis of originality, creative imagination, characterization, artistic quality, technical merit, and the adherence to line limits. All decisions of the judges are final. Judges will be appointed by the Managing Editor. Any participating board representative, administrator, editor, or IBPC board member can suggest or nominate a judge. The judge shall be a neutral party who is not affiliated with IBPC or any of its participating boards or forums. Judges' tenure will be four months, unless that is not possible. Suggestions for new judges will be considered at any time specified by the Managing Editor. Any current Director may call for a vote to remove any or all judges if deemed necessary. A quorum is not necessary. Judges may be removed by a majority vote of attending Directors. Competition Level: When a poem places 1st, 2nd, or 3rd in any of the Monthly Competitions, it is automatically submitted into the Annual Competition, unless otherwise requested by the author. Judging Level: The IBPC Managing Editor will remove all names and board titles to make each submission anonymous. These will then be forwarded by email to the judge. Multiple Submissions: There are no restrictions on number of poems per poet which may be submitted for consideration. The judge will consider all poems submitted for the Annual Competition. Multiple Selections: Only one poem per poet may win or place in the Annual InterBoard Poetry Competition. Since submissions to the judge are anonymous, if more than one poems from a single poet are selected, that poet will be asked to choose one to represent him/her. The judge will then make appropriate alternate selections. Each year, the prizes of 1st, 2nd, 3rd places and an Honorable Mention will be awarded. These will then be published in the periodically released IBPC Anthology. As with the monthly competition, all rights remain with the author. Judges will be appointed by the Managing Editor. Any participating board representative, administrator, editor, or IBPC board member can suggest or nominate a judge. The judge shall be a neutral party who is not affiliated with IBPC or any participating board or forum. Suggestions for new judges will be considered at any time specified by the Managing Editor. Any current Director may call for a vote to remove any or all judges if deemed necessary. A quorum is not necessary. Judges may be removed by a majority vote of attending Directors. Here is a link below to the IBPC 'Judge' Synopsis. From what understand, each judge goes on a four month rotation. Let's welcome FreeWright's Peer Review to the IBPC, as the newest board to hop on board. Sorry to see Poets.Org and SC Writer's Workshop both withdrawing from the IBPC. It appears that Rabbit Hole is no longer a particpating board. Welcome to the newest board to join the IBPC: The Write Idea ! Would it be possible to re-submit (older) poems that did not place in past competitions from prior quarters (so a new judge's eye can read them)? Rus has responded that "The answer is sure. There is no rule against it. And why not anyway?" I'm in agreement with him as well when he suggested that "Any resubmissions be spiffed up a bit, because maybe there was something other than the personal preference or the prevailing mood to the previous judge's decision." We're going forward with submitting two poems from June. Welcome to the newest board to join the IBPC: PoetryCircle.com! Updates: Sorry to see that The Poet's Graves is no longer a participating board. Updated old links, the IBPC mission and added Babilu & Muse Motel.